Numerous criteria is used to evaluate Communities such as, employment, education, SAT scores in excess of 1,050, air quality, commute time, median home price, low crime and quality of family life as also reported by Realtor Magazine. Sperlings Best Places will match you with your wish list of best places. And CNN got the best url for the CNN #1 Site for Top 10 Lists. My National and International Prudential Fox Roach Real Estate Relocation Network can help whenever you need expert assistance to find your “Best Place” to live when you’re relocating out of the area. What is it that makes Top 10 Lists so fascinating? 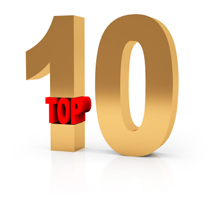 Top 10 Tantalizing Tidbits is a list that begs to be read. Ten seems to be a natural standard of measurement. There’s probably at least one Top 10 Hieroglyphic List carved in stone rating the pyramids. And who can forget the Jolly Old Elf, himself, “making a list and checking it twice”? What do you think is the best place to live in Chester County and Montgomery County? Contact or call me, 610-889-5509 when you want some help to assist you with your Real Estate Process. I have “Home Inspection Check Lists”, “Moving Lists”, “Pre-Listing Fix Up Staging Lists” and “Pre-Settlement Walk Through Lists” to help my Main Line Area Home Buyers and Sellers. This entry was posted on Monday, July 21st, 2008 at 1:31 am	and is filed under Chester County, Lifestyle, Montgomery County. You can follow any responses to this entry through the RSS 2.0 feed. You can leave a response, or trackback from your own site.